The problem with our younger generation in understanding Jammu and Kashmir is that they know very little about past. They key events most of the people in our age remember are the partition and wars. 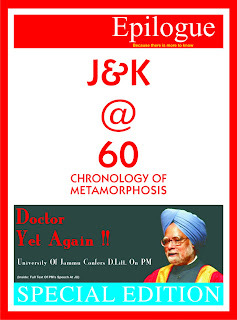 Our August 2007 issue was essentially a commemorative volume chronicling metamorphosis of change Jammu and Kashmir underwent from 1947 to 2007. Every key development arranged in a sequential order made this issue an essential reference on J&K. Which is why August 2008 issue is still in demand not only from across the country but also from abroad.